This isn’t what this blog was supposed to be about. In fact, I was writing this week about something quite dear to my heart. Something I believe in to my core. Something that is so very important in this day and time. And then life got in the way. But as with all things that occur in this incarnation, my way of dealing with the good, the bad, and the ugly, even the joy- and sorrowful, is to write them out. That other blog will just have to wait. I talk about my dogs a lot. They’re such an enormous part of my world, and enrich it in so many ways. They do yours as well, no? I’d stop here and provide statistics as to how much money folks spend on their pets, about how many families are owned by pets. But that’s not really the focus this time. Although it’s a lot of money involved and a huge percentage of our population. One of the greatest sorrows in having them is that one day—all too soon—they’ll cross that rainbow bridge. Even if they live out longer than their predicted life spans, it’s always, always, far too soon . . .
Having an oldster is also one of the greatest honors that can be bestowed upon us. They’re so noble, enduring the indignities of old age with scarcely a whimper. The hearing goes, as does the vision, and they compensate. Even if orthopedically sound, the bones get frail, the hindquarters weaken. The day looms on the horizon . . .
And you know that every day with them is a beautiful gift. Still, when they go . . .
Scoutie was not one I bred in my home. A dear friend did, and gave me the great honor of taking her home as a baby. I fell in love with her then (which we breeders know not to do—they have miles and miles of health clearances to pass before they can be in the breeding program, not to mention growing into those of sound type and structure as well). It wasn’t, however, like I had a choice. Sometimes they grab you by the heart and just refuse to let go. Ah, the miles we traversed together! What a joy she was to show in obedience, always the happiest dog in the ring. We still laugh at how she would wag through her sits. A judge and crowd pleaser for sure. And such fun running her hunt tests. Fearless she was—as long as she could still see me! Of course with her one litter we ended up at the vet’s at midnight for an emergency C-section, and I’ll never forget how she awakened there to lift her groggy head and start licking her babies. From that she gave me one of my other true heart dogs, Harper Lee, who has gone on to many wins and titles, when not lying across my lap. As the end was drawing nigh, I of course knew it. Had known it for a while. And appreciated every day as the gift it was with her. I was gone all day, and hadn’t been home ten minutes when in true Scoutie fashion, she took that hardest decision from my hands. After waiting until I got back. And as she’d done with every step she took in this life, she wagged until the end. What a wonderful lesson these kids are for us. The unselfish love they give. The constant, unconditional caring. The noble march through old age and into the great beyond. Would that I could be like that. Anyone who’s ever loved a dog, truly loved a dog, knows the depths of the sorrow. How blessed I was and am. She’ll stay in my heart forever. Because of course as we give voice to, and sometimes actually know, in the end it’s those we love who matter most, whether two- or four-legged. My hope is that you are so loved . . .
Oh, I am so sorry for your loss. However, I am more happy to know that you had this precious baby in your life. While loss is so terrible, it is only terrible because of how wonderful they were in our life. So true, Renee. This is the price we pay for loving so deeply, and it’s an honor to do so . . . Thank you, Kathy. And yes–Scoutie was definitely an angel . . .
My sister told me when I was in my teens that it actually gets harder to say goodbye when you’re older. It was hard to imagine at the time, but now I see. I haven’t had a dog pass away (of my own) for such a long time, and I do dread the emotions that will come along with it. I tend to be so thin-skinned. When my conure passed away suddenly, it was like the sky had fallen, and it still makes me teary. Their personalities burn into us, don’t they. 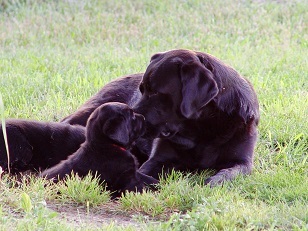 Scoutie was a beautiful dog, and really, all of your labs are just so NOBLE. My heart goes out to you, and we are thinking of you. Oh, yes, Andi–their personalities burn into us. So well said . . .
Awwww, I’m so sorry Susan. I just lost mine last August and still miss her so I know the feeling well. So glad that she waited until you got home. I have often said the same—animals teach us how to age, though we’ll never be as good at it. Happy trails to your puppy. Oh, so sorry for your loss as well, Colleen. Perhaps they’re playing together, across that Rainbow Bridge . . . Sorry for your loss. Those special ones are the hardest to let go. Oh, they are, Jean, aren’t they . . . Tears!!! You words went straight to my heart and then came the tears. What a beautiful tribute to your pup, who, as any family member would, has left a bit of a hole in your heart with passing. My three greyhounds all died within one year; I’ve never really gotten over it and it’s the “goodbye” that has prevented a new “hello.” I’m sorry for your loss and am sending a big hug your way. You know, I often say, and did so the other day, that the only thing that saves me when I lose one is coming home to the pitter patter of other Labrador paws. I don’t think we ever get over the loss, but the others help to carry on . . . Kiss you Lab for me, Lori. And cherish her every day. Susan, I am so sorry about Scoutie. It is so painful when they leave us, yet the joy they give somehow makes it all worthwhile. I’m facing this with my little Decaf right now. She has lost most of her sight and hearing and those old bones are struggling. The other night she made a really strange noise and we felt certain her time had come. Thankfully, she’s still with us but each moment is extra precious. Cherish each moment, Tamuria. Each one is a gift. it is so hard to lose a pet for those of us that truly love our pets. WE love them like people so we mourn them so as well. It is, isn’t it. True family members. Aw, Susan. I’m sorry. What a good dog Scoutie was! Thanks for sharing that. A big (virtual) hug to you. Thanks for the hug, Jen! What a great article to have crossed my path today! I lost my 14 year old Lab last summer only 2 days after her birthday. Good gracious, I loved that dog with my whole heart….she was there when I met my boyfriend, who became husband, and brought our 2 kids home. Even stood by me for an extra year after my Dad died. I miss her so much and you are so right about how important and meaningful they are to our lives. Thank you for this article! That’s just another piece about the oldsters, isn’t it, Anne–they’ve traveled down so many roads with us. Been by our sides through so many life transitions. Makes it all the more poignant. Minpins are such hoots, Beverley! I’m so glad you have him (even though it sounds like one of those Mom deals :). And yes, such abiding love lasts literally forever . . .
“What a wonderful lesson these kids are for us.” Yes! They are simply the best. They are the best, aren’t they, Reba. Such marvelous beings. It is so hard to lose your fur baby. We lost our dog Pal a few years ago. I took comfort that he lived a healthy long life. I miss him everyday. I am so sorry for your loss. I’m not sure the missing them ever goes away, Ann. Especially when they’re part of the family. We moved from Ca to VA and my 1 and 4 year old girls got not 1 but 2 puppies (rescued).. after I left my ex… the dogs became 2 more mouths that I had a hard time feeding and giving attention to… I ended up giving them back to the rescue center who would break them apart (possible to rehome them) after 6+ years.. and as sad as I was.. I knew it was right for them…. I couldn’t give them the love they needed. So, different but I get it. So often the dog’s care is left to the mom, Kristen, who is already overloaded. I try to prevent that. As folks often say, you have to pass a test to get one of my pups that the CIA would be proud of. I am so sorry for your loss! Pets are like another member of the house and it’s hard to lose them. It is, Jacqui, it is. My heart feels pains while reading this, it’s really sad to think the reality happening and missing someone. I’m so sorry for your loss, I’m glad to know that your dog brings so much fun and happiness in your life. Oh, they do, they do. I cannot imagine life without them. As I write, my beloved tripawd, Buddie, is at my feet. He has grabbed our souls and is family, as every dog who has shared our home has. I do indeed feel lucky. Kiss Buddy for me, Beth. Cherish him. My heartfelt condolences, Susan. At 1 point we had 5 dachshunds at home and the pain of bereavement was cushioned by the need of the hour to help the surviving dachshund family members cope with their grief. Dogs do grieve and if one has lived with them for a long period of time, the humans pick up the signal too. The most painful bereavement was when the last dachshund went a few months before his 18th birthday. He suffered an aneurysm at the vet’s clinic but kept breathing until we got him home. I told the vet that putting him to sleep wasn’t an option and took him home in the hope that we still had some time together. It was a rainy day and I guess Bruno knew his last duty was to see the ladies safe in the house before he left. Within 20 minutes he took 3 sharp breathes and was gone resting his head near my heart. I’m flooded with memories reading about Scoutie and thinking, if one has not known the love of a canine companion, then they have missed out on the most precious experience possible. Aren’t the memories so vivid, Vatsala. They stay with us forever. And yes–dogs do grieve. When I got home from the vet’s, I carried in the blanket Scoutie had been wrapped in. The rest of the furr family are usually rambunctious when I come in, but they all just stopped still. Then, one by one, came up and smelled the blanket, quietly, softly, mournfully. My home remained quite somber for days . . . It is tough losing them, Melanie. But ah, the joy they bring . . . Thanks, Ron. You’ve known her through pics all her life . . .
My first dog was hit by a car. He lay there until I came to the road, then wagged his tail one time and died. Much too young. I brought home a kitten from the Hong Kong SPCA in 2001. She’ll turn 17 next month. She still looks and acts like a kitten, but of course she’s not. Every day’s a gift. Every day is a gift, Michael. And a beautiful one . . .
I’m so sorry to hear about your loss. There is a movie coming out about dogs and I don’t even know if I could enjoy it knowing the hurt losing a dog causes. At least we have the happy memories! I still can’t watch Old Yeller, Carissa. Or any movie where the dog dies . . .
My mama has a dachshund named Minnie. She has been mama’s little angel for a long time now, and especially since Mark’s passing recently (mama’s hubby). I got to know Minnie while I stayed with them the past 7 weeks. Oh what love and comfort she has given to mama as she finds ways to fill the void Mark has left in her home and heart. They are so blessed to have each other and I pray they will continue together for a long time to come. I just can’t imagine it any other way. Thanks for reminiscing and allowing me to do the same. Blessings Susan. I’ve found nothing on this planet to be more comforting in times of sorry than a furr kid, Teresa. Always there. Always loving. When I went through the long ordeal with my parents, these kids literally saved me. I was with you on every level as you shared the beauty and wonder of dogs. Some of the most painful, happy and beautiful experiences I ever had was with our beloved dog Bacardi ~ letting her go was so incrediably difficult… She was an Angel who came to a family in great need to ease our suffering. To write of she love and devotion would fill this page ( and did fill a chapter of my book ) so I just thank you for wonderful your post . To share the love of dog is such a gift <3 Thank you Susan. Susan, it is comforting to hear your story. I miss Domingo who we lost in July. The connection with a dog is so special. I didn’t cry for months but would visit the shelter and one day there was a dog there that looked a lot like Domingo. I picked him up and sat with him and cried hard for a while. I wasn’t ready for a new friend yet, but the pup and I had a connection. Dogs are such healers. My heart goes out to you. Isn’t grief just an odd process, Candess. We think we’re okay and then blam! A trigger comes along and just brings us to our knees. And yep, it’s too soon yet for a new furr kid for you. But one day, that child will grace your life . . . I am sorry for your loss Susan. It sounds to me like you both were blessed–to have each other. I feel your pain and I imagine that writing this post was a catharsis for you. I have not had a pet since I left my parents’ house because. as an adult, I am always on the go. My mother and brother have began grieving for a dog they have had for approximately 12 years since the vet told them that she will have to be put down soon. Funny thing, Rachel, the catharsis was why I wrote it. I get over many things by writing them out. And oh–give your mom and brother a hug for me. Anticipating the event is just excruciating. Being a multiple dog owner many times, it’s always so hard to let them go. But, as each one leaves another comes in to fill the void. For which I am most grateful. And that gratitude gets us through, doesn’t it, Joyce. I am OH-so grateful for my kids here. Really enjoyed your post Susan! In the end that’s all that matters, isn’t it, Joan–that all our furr kids knew how much we loved them. Seeing them to the end is just the price we pay for getting to love them. Oh, I am sorry about your dog…she seems to have been lovely…Dogs always have a special place as pets (though I have always been more for cats, though I have had dogs when I was little too). I actually have both, Katarina. Can’t imagine life without them. I am so sorry that you lost your dog. I was not a dog lover until we got our dog, Zeus. He has a tight hold on my heart. Isn’t it funny how that happens, Karen–you think you’re immune and then one day, a four-legged steals your heart . . . This was very moving and reminded me of a few family pets who tugged at our hearts and left us with many heartwarming memories. Hugs and love to you. May Scoutie keep watch over you. Thank you, Elizabeth. I’ll have many of them waiting for me when I cross over . . .
Oh, I’m so sorry for your loss. My heart goes out to you– I know all too well the deep, sorrow that accompanies the loss of your fur child. And that’s what they really are. They are just as dear as other family members and the grief is so hard. I’ll ask my Champ and Dumbledore to look for Scoutie at the bridge. I’m sure they will be great friends. I love that, Jennifer. Please do ask Champ and Dumbledore to look out for her. And funny you mention that–as her spirit left, immediately I saw Miss Emma, stick in her mouth, wagging, welcoming Scoutie to the other side of the bridge . . . I am sorry to hear this. I only had pet fish. Though they didn’t live as long as dogs, I felt some loss as well. I had pet fish too! Susan, I am so sorry for your loss. We have a dog that is a member of our family. She has been with us for 10 years. She makes it a little less lonely when the kids are all gone. Big hugs to you. They are a part of the family, aren’t they, Christy. And thank you for the hugs!